The Netherlands Antilles dissolved on 10 October 2010. Curacao and Sint Maarten (the Dutch two-fifths of the island of Saint Martin) became autonomous territories of the Kingdom of the Netherlands. 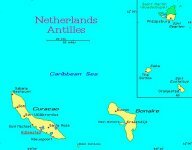 Bonaire, Saba, and Sint Eustatius now fall under the direct administration of the Netherlands. Though no longer an accurate term, Netherlands Antilles continued to be used commonly to refer to these Dutch possessions in the Caribbean. 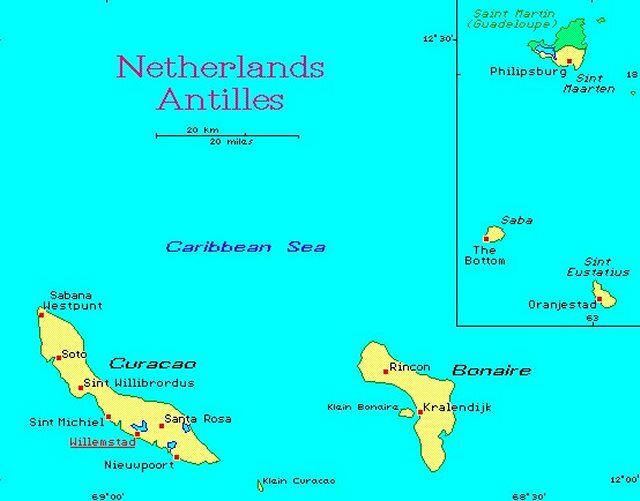 The Netherlands Antilles included Bonaire, Curacao, Saba, Sint Eustatius, and Sint Maarten (the Dutch part of the island of Saint Martin). It consisted of 2 island groups, Curacao and Bonaire located off the coast of Venezuela, and Sint Maarten, Saba, and Sint Eustatius about 800 kilometers (430 miles) to the north. The United States operated 2 Forward Operating Locations (FOLs) in what was generally known as the Netherlands Antilles, one on the island of Curacao and one on the island of Aurba. The FOL on Curacao is at Hato International Airport and the FOL on Aruba is at Reina Beatrix International Airport. These facilities were used for a variety of functions, including: Aerial detection and monitoring of suspected air and maritime drug trafficking activities; reporting of illicit trafficking activities to US and international law enforcement authorities for interdiction, apprehension of illicit traffickers and seizure of illicit cargo; and as part of a larger multinational counterdrug cooperation effort with other countries in the region committed to disrupting these transnational criminal activities in our hemisphere. Each FOL could host up to 8 aircraft, depending on aircraft or airframe. US Aircraft that could support counter-illicit-trafficking missions from the FOLs included the E-3 Sentry, RC-135V/W Rivet Joint, KC-135 Stratotanker, P-3C Orion, E-2 Hawkeye, and the C-130 Senior Scout. A bilateral agreement between the between the Kingdom of the Netherlands and the United States governed FOL operations in Curacao and Aruba. In compliance with this agreement, operations carried out at the FOLs were limited to activities that detect and monitor illicit trafficking. As of 2011, 11 US military personnel were permanently assigned for periods up to one year. These were personnel who fulfilled key roles within the FOLs, for example, the Commander of the FOLs. At the same time, approximately 250 US military personnel were temporarily assigned for periods from about 2 weeks to 6 months. Their roles ranged from aircrew who conducted aerial-counter-illicit-trafficking missions to logistics and maintenance personnel who supported the FOL missions on the ground. In addition, approximately 53 US citizens and 62 Dutch and Curacao citizens also provided contracted support to the FOLs. As part of the return of the Panama Canal Zone to the Panamanian government, the United States ceased counterdrug operations from Howard Air Force Base on 1 May 1999. To permit the United States to continue to mount counterdrug operations close to the drug producing or source zones and illicit drug transshipment or transit zones, the US Southern Command, which was responsible for counterdrug operations within the region, sought usable airfields. The United States subsequently secured 10-year agreements for the use of 4 airfields for counterdrug activities. However, each airfield required some construction to support a designated mix of aircraft. In the spring of 1999, the Defense Department and the US Customs Service began conducting limited counterdrug operations from airfields on Aruba and Curacao in the Netherlands Antilles. By the end of 2000, the Department of Defense estimated that about $63.4 million would be needed for enhancements to runways and aircraft parking areas at the international airports in Aruba and Curacao, as well as in San Salvador, where another of the 4 airfield agreements had been secured. In addition, the Air Force estimated operations and maintenance costs for Aruba and Curacao, as well as at FOL Manta in El Salvador, to be about $22.9 million through 2001 and anticipated that this cost would increase to an average of $32.3 million annually once the sites became fully operational in late 2002. As of late 2000, the forward operating location at Curacao was expected to host a range of Department of Defense aircraft supporting both source and transit zone operations. The facility would accommodate 4-6 F-16s used in the transit zone; 1-2 Navy P-3s, one Navy E-2, and one Air Force E-3 airborne early warning aircraft for detection and monitoring in the source and transit zones; and 2 C-130-type planes. Initially, the Department of Defense planned to construct the US facilities at the eastern end of Hato airport. However, this construction would have required extending electric and utility lines. The Department of Defense ultimately decided to construct the facilities at the western end near the Royal Dutch Naval Air Station. The Dutch favored the move since they used similar aircraft to conduct counterdrug operations and could share facilities if necessary. In addition, the Department of Defense could benefit from the security provided by Royal Dutch forces and minimize the overall visibility of US personnel. As of December 2000, the Department of Defense had not studied the costs of making the change, but did not anticipate that the move would increase overall costs. DOD estimated it would spend about $43.9 million to construct new facilities and upgrade existing ones. Of the total costs, about $29.5 million would be used to construct new parking spaces and a taxiway that would connect the aircraft parking area to the runway. An additional $14.4 million would be used to construct an operations center and hanger and maintenance facilities. The Air Force estimated that operating costs would average about $7.5 million through FY01. A permanent presence of 6 personnel would provide support services such as site maintenance, communications, and resupply. By the early 2000s, progress continued in SOUTHCOM on the FOLs operated to to replace counterdrug aerial detection and monitoring missions formerly flown by Department of Defense and interagency aircraft from Howard Air Force Base in Panama. From the beginning of operations on 1 May 1999, the US had staged air operations from Curacao and Aruba in the Netherlands Antilles, and Manta, Ecuador. The total numbers of hours on station were equal to or greater than when the US flew from Howard, and the area of coverage was greater. In FY06, funding was provided to maintain and operate the FOL on Curacao. At that time, the FOL consisted of 40 facilities, of which 15 were buildings, and provided basing and logistical support for a steady state of 6 aircraft and 250 personnel with a capacity to surge to 8 aircraft for 2 week periods. Total FY06 funding was $1.45 million. The was for the completion of the fire department shelter ($725,000), beginning of a construction design review for the repair of cracks in the aircraft parking ramp ($475,000), and the replacement/upgrade of the force protection camera system ($250,000). FY07 funding for the Netherlands Antilles included separate funding for FOLs on Curacao and Aruba. $18,134,000 was provided for base operations support on Curacao, which was used for the design and repair of the aircraft parking ramp due to cracking, replacement of corroded fence fabric on perimeter fence, and base and other support. The base support contract in FY07 included maintenance and repair of facilities, along with 18 different minor construction projects. Also includes operations and maintenance of the lodging, fire department, communications, and operations infrastructure. Other support requirements included management support, supplies and equipment, travel of deployed personnel such as security forces, fire fighters, communications support and other support. $350,000 was provided for base operations support on Aruba, where the FOL at that time consisted of a single building, and the funds were used for management support, supplies and equipment, travel of deployed personnel communications support, and other support. FY08 funding for the Netherlands Antilles included separate funding for FOLs on Curacao and Aruba. $20,616,000 was provided for base operations support on Curacao, which was used for the replacement of concrete slabs (as part of project to repair aircraft parking ramp), design of a refueler truck parking area, the design of a GOY fuel tank area, the construction of pavement for a fire department shelter, the construction of a TACAN shelter and the installation of an antenna (replacing highly-corroded facilities), life-cycle replacement of computers (1/3 every 3 years), upgrade of communications switches (replacing outdated ones in the SCIF area), upgrade to Promina 800 communication system to control access to phone lines and required for network access within the SCIF, purchase of server racks for new servers and associated equipment, installation of fiber optic lines to Fire Department and TACLAN, the rewire of Open Storage area to meet new EMSEC requirements (equipment only, TOY costs included in the base support contract), and base and other support. The FY07 base support contract included maintenance and repair of facilities, including 26 different minor construction projects totaling $555,000. This total included replacement of the telecommunication system for $227,000 in order to meet new standards and upgrade capabilities. This also included operations and maintenance of the lodging, fire department, communications, and operations infrastructure. Other support included management support, supplies and equipment, support of deployed personnel such as security forces, fire fighters, communications support, and other support. $328,000 was provided for base operations support on Aruba, which were used for management support, supplies and equipment, travel of deployed personnel communications support, and other support. During 2010, counter-illicit-trafficking activities carried out from the Curacao and Aruba FOLs amounted to 803 individual sorties to detect, monitor, and report illicit trafficking in the Caribbean Basin, combining for a total of 4,516 flight hours. These missions contributed to the seizure by US and international partners in the Western Hemisphere of, 114 metric tons of cocaine, 60.8 kilos of heroin, and 2 metric tons of marijuana, with a combined estimated street value of more than $2.8 billion. During 2010, the FOLs also impacted the local community, putting more than $89 million into the local economy. Locally procured services and commodities included: Lodging, fuel, rental vehicles, contracted support, facilities maintenance, utilities services, meals, and other supplies and equipment. FOL personnel also support to local community assistance projects during 2010, including 59 major community assistance projects, such as assistance to local schools, orphanages and retirement homes. More than 684 FOL volunteers contributed approximately 2,533 hours and their skills to improve and repair facilities and grounds in addition to $40,818 US dollars donated. These activities further strengthened the friendship between the United States and the Kingdom of the Netherlands. On 19 October 2012, Assistant Secretary of State for Political-Military Affairs Andrew J. Shapiro and Kingdom of the Netherlands Ambassador Rudolf Bekink signed a new US-Kingdom of the Netherlands Status of Forces Agreement covering the Kingdom's territories in the Caribbean. The 5-year agreement expanded and built upon the success of the previous 2005 agreement, and would facilitate participation by US military personnel in joint exercises and training activities, ship visits by the US Navy, and other cooperative activities with the Royal Netherlands Armed Forces in Aruba, Sint Maarten, Bonaire, Sint Eustatius, and Saba. While Curaçao was not covered at that time by the new agreement, the agreement did allow Curaçao to join at a later time.